I have used both a BlackBerry and an Android for blogging on the go especially during my Post-A-Day Challenge. I found it especially useful to do when I was pressed for time. However, there a couple of limitations I have noticed with the apps which should be noted before you go to try and do it for yourself – assuming you want to make your blog post looks as awesome as it can. Before I go on, I have to mention that although I have not used the WordPress for iPhone app I have heard that many of the same issues exist and so I assume these tips are just as relevant for you iOS users but can’t confidently tell you one way or the other. The key thing I have found was to do some planning before you try to blog from your phone. Why? Because it will make your life way easier if you set up certain aspects of the post on a computer beforehand. There are a couple of reasons for this which will be laid out below. Pictures (Inserting): It is way, way easier to insert an image on your computer. Mainly because the WordPress app only likes to put images on the top or on the bottom of your post then you have to move them around manually. As well, you can make sure the picture resizes correctly, and it will, of course, upload quicker. Pop the pictures in your blog, name them, and put fragments of thoughts…or even “blah blah blah” between them to show yourself where to stick your content. Pictures Resizing: Chances are the pictures you take on your phone are going to be too big for your blog’s theme. Because of this it will end up looking horrible til you get to a computer and fix it OR feel like figuring out the math and manually resizing it by constraining it with HTML code. The image settings within the WordPress app don’t necessarily reflect your theme’s so your best off taking one of your phone’s camera pictures already on your computer and seeing what the length of it gets resized to when you resize it to the width of your blog’s theme. Now go into your phone’s WordPress app’s settings and set the “custom” image length and width to reflect your findings. Links: They’re a pain to add in correctly on your phone I’ve found relative to doing it on your computer. Best thing is to, again, plan it beforehand. As well, the WordPress system on the full web gives you a helpful pop-up box which lets you easily reference previous blog posts by just clicking. Tags: While links are a pain to add in, technically, tags aren’t. However, if you want your posts to be able to link back to each other and you plan on using tags you’ve already used for a topic make sure you add them in beforehand. Again, the full WordPress gives you a drop down of all the tags you’ve previously used so everything stays nice and neat whereas the mobile app doesn’t do this. It sounds like nothing but wait til you’ve been blogging for a while and have hundreds of posts and have to remember what the exact tags you previously used were: not fun. URL: The URL of your post is an important part of SEO (Search Engine Optimization). WordPress online allows you to edit the last bit of your post’s URL whereas the mobile app just takes the title of your post. Bullet & Numbered Points (aka ordered and unordered lists): These are just annoying to set up and so I again, recommend setting it up beforehand and then loading the very fragmented, nonsensical (to everyone but you) post on your phone and edit from there filling in all the gaps. In case you are wondering, yes, I used my own tips to write this post. The words “blah blah” were actually used quite frequently in this post before it was fleshed out on the subway and streetcar where I am now. I guess you can sort of accuse me of breaking one main tip (plan ahead) into a bunch of little ones but from all the bloggers I’ve spoken to, not many have considered this method for blogging on the go and ask me how I’ve managed to do it on numerous occasions and still make the post look as good as if I’d blogged from a computer. Now my secret is out. Anyone else out there try any similar methods? Anyone know any better methods? Let us all know in the comment section below! I can’t believe I am almost at a full year of posting daily! There were days when I was too drunk to right anything coherent, there were days when I had nothing to say and days when I was so busy I didn’t really have time to post but still I soldiered on. Including this post, I have 18 posts left to make it to the full year of the Post A Day Challenge 2011. I know there are less than 18 days left in 2011 but you have to remember my first post which I count as part of the Challenge was on January 4, 2011 therefore I have to go until January 4, 2012 to make it complete…don’t I? I have learned a lot during this experience of the Post A Day Challenge. I reflected on it throughout the challenge as well in different blog posts. I grew my readership massively and that felt – and still feels – amazing as it continues to grow. I have had so many experiences via writing this blog and have done things I never believed I would do all and am the better person and man for it. All in all, this has been a great year and I am going to be continuing the post a day challenge with myself for as long as I can into 2012 and beyond. You have probably all noticed the badge below on the right hand side of my blog this whole year I think I am going to leave it there because I don’t see a reason to take it down. Sort of a badge of honor. Maybe they will make a 2012 Challenge and that will keep me on my toes to stay with it and keep posting. Maybe next year I will try to up the ante and make it two posts a day for 2012 but believe you me one a day is hard enough! One thing is for certain, after this year I definitely earned the title of a blogger! Is there anything I haven’t talked about which you think I should? Any place in Toronto or the GTA I should explore? In late September, WordPress decided it’d be a superb idea to change their platform’s Admin Bar to a more simplified version. They posted a blog post about it on their blog titled “Enjoy A Shiny New Simplified Admin Bar” but personally I have not been enjoying it. In fact, I have been finding this new bar downright annoying. I know, as well, that I am not alone on this. When I asked on Twitter if I was alone on this I got an immediate response and I would like to hear from other bloggers using the WordPress platform if they are with me on this. I understand where WordPress was coming from when they simplified it. According to the blog post linked above they did it to “make it easier for [a blog’s] visitors to interact with [a blogger] via Likes and Follows, so [they have] cleaned it up a bit.” And I am all for this, keep innovating WordPress! Keep trying new things and making it easier for us to share content. But I say all that with one major stipulation – if it aint broke don’t fix it. What I mean is not one place in your post did you mention that you had looked into this and it would result in more Likes and Follows and you didn’t say that people had been complaining about the number of Likes and Follows they received. In fact, while I will sometimes Like a post I would say the vast majority of my friends, relatives, and acquaintances do not have WordPress accounts. Not, they-started-a-blog-once-don’t-post-but-have a-WordPress-account, they simply do not have a WordPress account. Even for myself I don’t think I have ever clicked that Follow button – for my own personal blog reading I subscribe to a site’s RSS feed using GoogleReader and if the site doesn’t have an RSS feed chances are pretty high I won’t read it again for a month or two if ever again. What I am trying to say is that this new Admin bar is trying to foster a community of bloggers to read each others blogs – I get it – but there is such a thing as oversimplification. Beyond that, I am not even asking you, WordPress and your parent company Automattic Inc take a step backward to the old Admin bar and get rid of the new one. All I ask is that you give us the option of bringing back the old Admin bar for our own personal use (maybe even only when we are on our own blogs?) or at least some of the functionality of the old bar that is lost in the new bar. So what do you say WordPress & Automattic? Bring back the option for the Old Admin Bar? What do you say readers – looking at those of you who are bloggers and use the WordPress platform – do you want the old bar back? “Electricity vs The Internet”? How Is This Even A Question? In the Post-A-Day Challenge there are often days where some of us need help figuring out what to write. 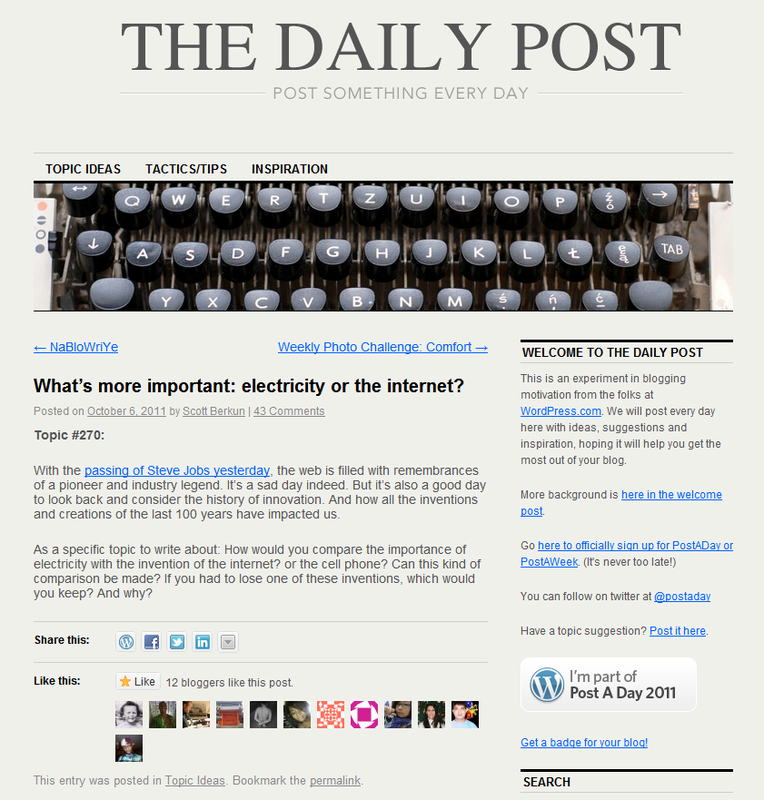 As such, WordPress, has set up a blog called “The Daily Post” to help us think of topics on days when we have nothing. Tonight I decided to take a look at the blog, which I haven’t in a while and saw Topic #270: What’s more important: electricity or the internet? All I could think when I saw this post was, “REALLY?!?!?! How is this even a question? See below for a screenshot of the question in its entirety before I rip on it..and the 12 bloggers who “Liked” it as a topic. If you had to lose one of these inventions, which would you keep? And why? Well this here is a real tough one…what good is having all these computers and servers which make up the Internet if you have no electricity to run them? No matter what the power source they have to be supplied some sort of electricity otherwise they simply won’t run and then you have no Internet. I don’t even see how there is a debate on this – OF COURSE you have to choose to want electricity over the Internet because electricity isn’t useless without the Internet whereas the Internet is useless without electricity. The Internet can’t exist without electricity so the very concept of losing electricity but keeping the Internet just makes zero sense. Come on WordPress! I admit I was lazy today and went to your blog for some inspiration but I wasn’t expecting such laziness from you guys! I know it is hard to write a post every day – believe me 10 months into this challenge I know how hard it is – but this is just beyond ridiculous. I am very happy that the comments I read on the post (I didn’t read all 43) agreed completely with me. Maybe I and those commenters see this wrong…if we do let me know how else we can look at this in the comments below. You may have noticed since mid-August when you click the ‘Tweet’ button below my posts it would pop up the usual Twitter box which said the post’s title, had a link to the post and said that the post came “via @wordpressdotcom” and not “via @TheDanLevy” as it used to say. This confused me to no end until I found the blog post linked below by a fellow named Waqas Ali who you can find on Twitter under the handle @WaqasADay. 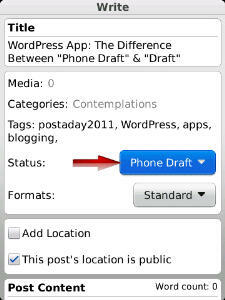 How to Add a Tweet Button With Your Twitter Username into WordPress.com « Waqas A Day. Since I implemented this change you will also notice that the actual share button has changed. This is something I learned myself when I started blogging regularly and used my phone to blog when I was out and about – like tonight. There are two options for saving a draft in the WordPress app for BlackBerry or Android and I’m pretty sure any other version of the app. There’s “Phone Draft” (as seen below) and “Draft” (as seen in the second picture). 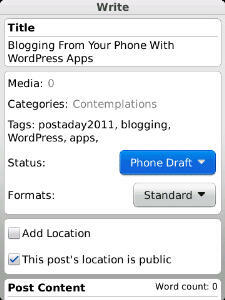 The above is what the screen on my BlackBerry Torch 9800’s WordPress app looks like. Pretty basic interface right? What my way of doing thing with this basic app is that I will often start the post with a title and pictures and tags and then, usually on the subway, I will load up the post that doesn’t have words and fill in my thoughts. 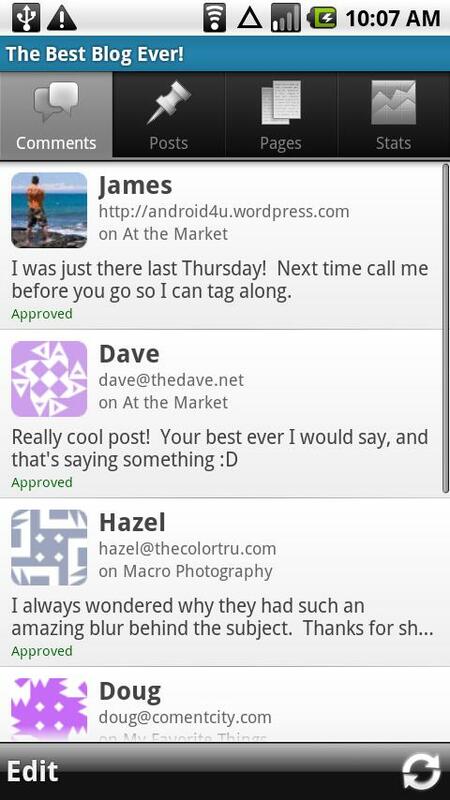 That’s my tip for all you bloggers using the WordPress apps be it BlackBerry, Android, or iOS. The apps themselves aren’t great especially for embedding pictures and posting around them. The apps also do a bad job of setting up your title for SEO purposes and using the full version to do a quick setup makes things end up looking so much nicer.